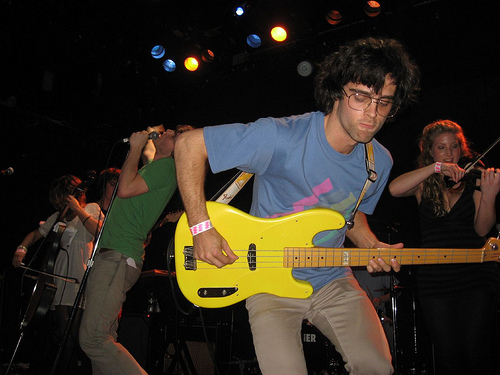 Ra Ra Riot is certainly a band that has come a long way. Since I last saw these Syracuse University grads perform, they’ve had quite the year. From an amazing tour with Vampire Weekend, to recording a brand new full length album, to the tragic death of drummer John Pike, there’s no doubt Ra Ra Riot has grown over the past year. Their live shows have always been energetic, but the energy at Bowery Ballroom on Friday, March 7th was beyond any expectation. Friends and family, along with fans of all ages joined Ra Ra Riot for their first-ever sold out show at the Bowery: a goal most bands will never reach. The Bowery show marked an ending to one leg of their tour before the band continues on to SXSW and various national dates. Kicking the set off, vocalist Wes Miles delivered a haunting solo performance of “Ghost Under Rocks,” a song written by John Pike. Midway through the tune, new drummer Cameron Wisch joined Wes onstage to continue the song, followed by the rest of the band. They then launched into an energetic set featuring some re-worked versions of songs off of their self-titled EP, as well as some new tracks that will be found on their full-length album, due out later this Spring. Ra Ra Riot was on point that night, delivering song after song flawlessly. Smiles were everywhere- I overheard some show-goers who had never before seen the band gush over the string arrangements and vocals. True to form, Ra Ra Riot shined live in a way that recorded material simply cannot translate. A special chemistry was evident- perhaps because this show was so special for the band. Standout new tracks were the uplifting “Oh, La” and both versions of the tune “Ghost Under Rocks” (the full band performed the song a second time later in the set.) One of my personal favorites was their interpretation of Kate Bush’s “Suspended in Gaffa,” a cover I’d heard but had never seen performed live. The re-worked versions of “Can You Tell,” and “Dying is Fine” were also crowd favorites. I was very glad to have been apart of this very special evening, and cannot wait to check out another Ra Ra Riot show! My day started out by catching Washington, DC trio Jukebox The Ghost. I’d never seen them live before, but had heard great things. Their catchy melodies were wonderful- I especially enjoyed “Hold It In.” I doubt I’ve seen the last of this band at the festival- I plan on catching at least one more set from these boys. Then I headed to a panel about artist management. It was only day 1 of the panels so few were there, but I’m hoping the energy picks up because I’m VERY excited about some of the panelists this year (Talor Hanson, anyone?) 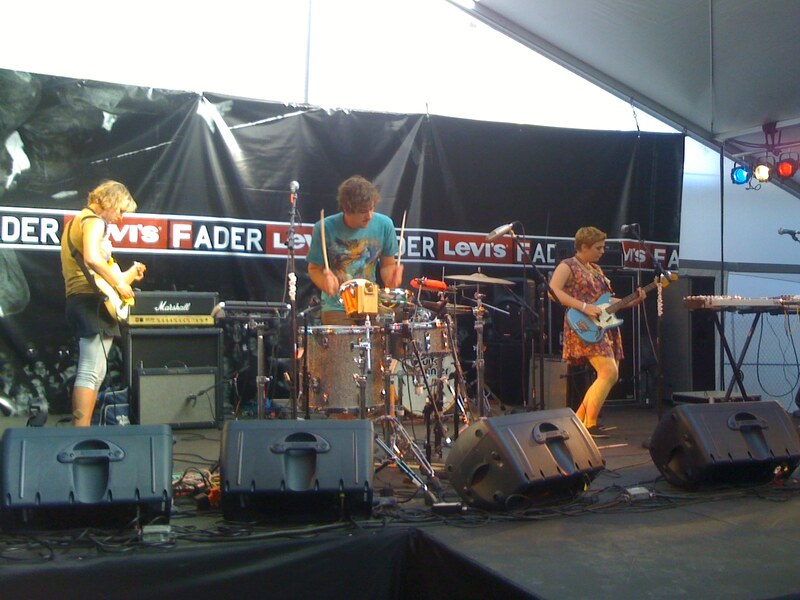 After that, it was time for Latola and I to hit up the Fader fort and watch The Ruby Suns. Wow! We couldn’t believe there were only three people onstage creating all of those amazing sounds. The best part, in my opinion, was the instrument trade-offs. All three drummed, played bass, and sang- not to mention the tamborine and flute thrown in for good measure. It was my favorite performance of Day 1 and it was easy to see that this New Zealand band had talent. After that, it was time to catch one of my favorites- Ra Ra Riot. I had just seen them last week, but I had to show Latola what I’d been gushing about, so we watched a short set by the band that impressed the convention-goers, many of whom had never seen Ra Ra Riot before. Their new song, “Ghost Under Rocks,” is pretty darn close to perfection. After that it was time to re-fuel and head back to the Fader Fort. We were exhausted, so we had decided to make it an early-ish night to better preserve ourselves for the rest of the festival- there are many more bands to see, so we’re excited!